A San Francisco based urban winery offering the first releases of Pinot Noir and Zinfandel in 2011. The proprietors are Baltimore transplants. John was a lawyer with an interest in brewing beer but his wife was more interested in wine. He had a short harvest internship at Freeman Winery in Sebastopol in 2007 and the couple devoted themselves to learning everything they could about wine. He followed that initial experience with two more years of internships at Freeman Winery. 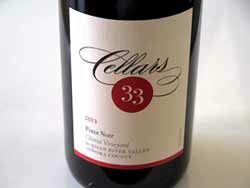 In 2010, the couple moved across country and settled in San Francisco and launched Cellars 33. The winery focuses on Chardonnay, Pinot Noir and Zinfandel from sourced grapes.